Sega is giving away a bundle of free games on Steam as part of its Make War Not Love 3 promotion. The bundle is part of its Valentine’s Day celebration, and is available for an unknown amount of time. In any case, everyone is free to log into the service and claim their copies of Jet Set Radio, Golden Axe, Hell Yeah! Wrath of the Dead Rabbit, and a collection of Sega Genesis and Megadrive games. 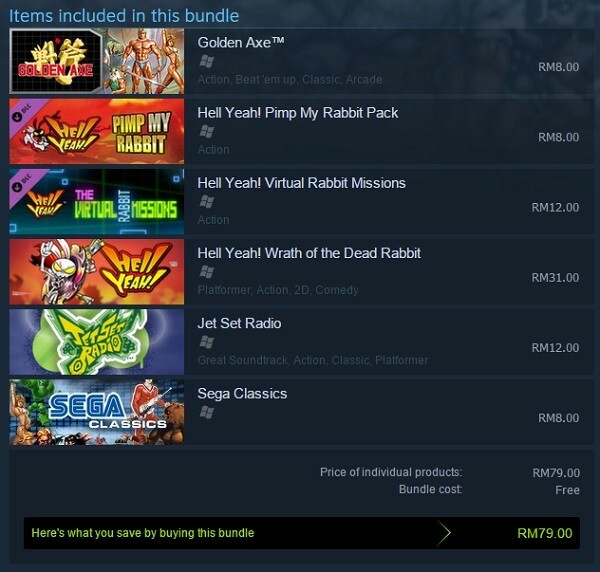 All a user needs to do is log into Steam and install Jet Set Radio, Golden Axe, or Hell Yeah! Wrath of the Dead Rabbit. All three have been set to free purchases, and adding any one of these automatically claims the other games in the bundle. Note that the Sega Collection includes a long list of Genesis and Megadrive games like Sonic The Hedgehog, Virtua Fighter 2, and Shining Force. The Make War Not Love event is just about giving away games. Sega is also tracking player activity within three games, Company of Heroes II, Dawn of War II, and Total War Attila. Players can unlock additional free DLC by playing games. This isn’t the end of the free games either. Sega is also apparently preparing a second bundle of games that will include Streets of Rage 2, Binary Domain, and Condemned: Criminal Origins on 18 February. Any DLC unlocked during the event will be released to players on 20 February. Company of Heroes II, Dawn of War II, and Total War Attila are all also currently on sale at 75-percent off on Steam. It should be noted that the Steam store page for the Sega Collection is missing, which means the quickest way to find out what games are in it are to just download the set and start playing.